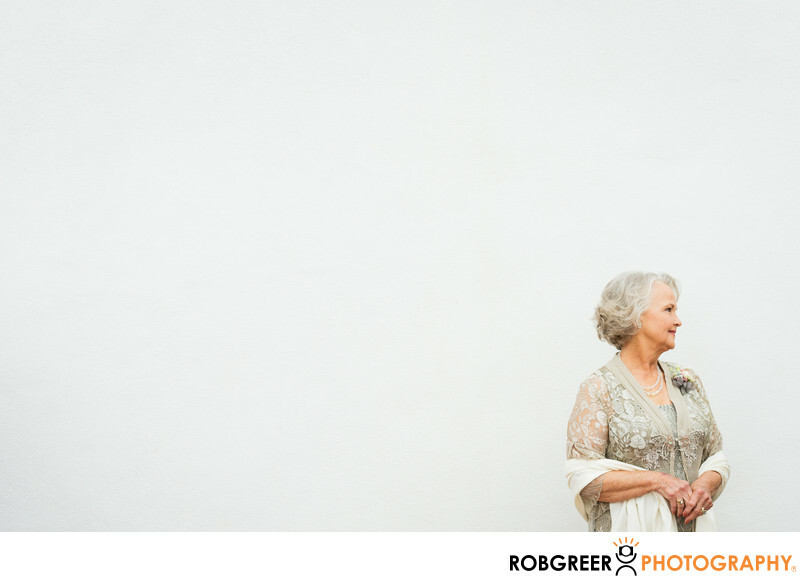 This image of the bride's grandmother at the Historic Cottage at San Clemente State Beach captures a lovely moment in time as she looks out of the frame. For my clients, this image is a sweet, candid portrait of someone they love. Four other viewers though, I'd like to believe that the viewer will want to know more of the story and wonder what the subject was looking at when I captured this frame. I honestly can't remember where grandma was staring or what held her interest, but from the smile on her face I can only guess that she was admiring a friend or family member. Although this photograph was taken at the Historic Cottage at San Clemente State Beach, this picture could have been captured at any wedding anywhere in the world. And even though the subject is against a blank wall, there is a story here. In much of my photography, you will see subjects placed against a blank wall either intentionally or solely through my composition. I do this in the belief that although background adds contextual substance to a photograph and often serves to highlight the venue or location where the wedding or reception occurs, sometimes a subject and isolation can create greater impact and is more honest in its treatment in that the viewer is prevented from ascribing greater import to an image based on locations, situations, or other supplemental information. Historic Cottage at San Clemente State Beach is located in San Clemente, California. Phone: (949) 366-8589. Website: http://www.parks.ca.gov/?page_id=24692. Keywords: Historic Cottage at San Clemente State Beach (9), San Clemente (9). 1/400; f/4.5; ISO 400; 70.0 mm.